This small, friendly site on the outskirts of Valkenbury is in a unique position at the top of a hill, which looks out over the historic town and its castle ruins. 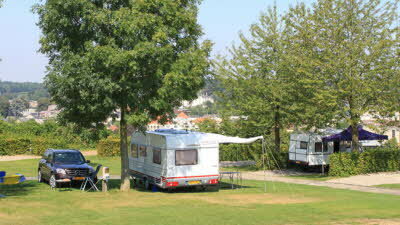 The staff are welcoming and helpful, and natural shade is provided to the level pitches by lush, green trees. You can enjoy the excellent pool complex adjacent to the site, complemented by a fitness centre and spa facilities. Den Driesch is perfect for outdoor explorations, particularly mountain biking. Staff can recommend routes, one of which goes underground through nearby caves. A steep walk or chairlift ride takes visitors into the quaint town of Valkenburg, with its open squares and lively bars and restaurants. The Velvet Caves are another notable landmark, while further afield Maastricht and Aachen are accessible by train. 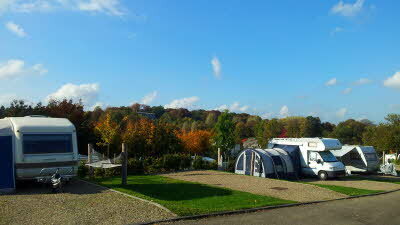 Valkenburg, Maastricht, Aachen, Liege, Health Resort Thermae 2000, Golf Courses, Caves, Dry Ski Slope, Zoo. Following N959 into Valkenberg, after 1km the road becomes Berkelplein. Follow this road continuing straight over the roundabout continue to follow the road round this will change to Oosterweg. Cross the junction where the road will become Reinaldstraat, continue until the road becomes Generindestraat. Turn right onto Kon.Julianalann following the road up Koninginneweg. At the end of the road turn left up Wilhelminalaan road. Follow this road until this road becomes Daalhernerweg. After 250m there will be a road to your right with the campsite signposted. 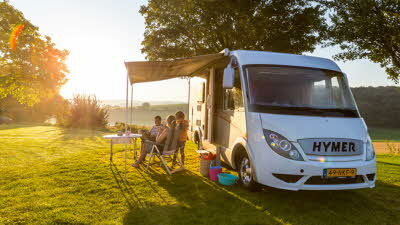 Follow this road called Heunsbergweg , the campsite is at the end of the road. We visited in August 2018 and really enjoyed our stay. It's tricky to get onto the site as it's up a very narrow and steep road, but it's worth it. You have to buy tokens for the showers, which were 0.70 Euro for a token which gave you a 5 minute shower. The showers were nice and clean. You can get a free pass for the local swimming pool from the site office. The swimming pool is indoors and worth a visit, it has a pool for swimming and a shallow pool and a very warm pool with a jacuzi, small lazy river and water slide. There is a lot more to do in the area than we expected, so we will be back. 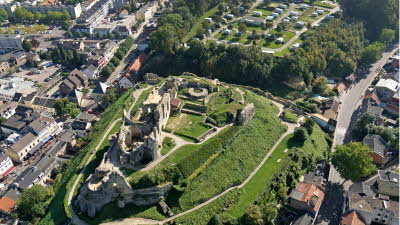 The site is situated at the top of a steep hill, overlooking the castle ruins and the town of Valkenberg. Very friendly reception staff, excellent English spoken. Very clean toilet block, pay for showers. Spacious, level, gravel/grass, hedged pitches with great views. We were visiting in May, early in the season and pleasant stay in quiet site. A bit pricier than most- 43.40 euros a night for 2 people in a small motorhome, no awning, no dogs. Valkenberg is a very pretty, neat, attractive town with open squares and lots of restaurants. We visited the Velvet Caves (where the tour was in Dutch only and no 21st century audio guides, but still lots to look at!) and the caste ruins. Stayed here in September 2017 for a week. 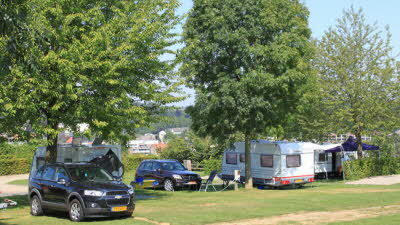 The site is right outside Valkenberg, no ,more than 15 mins walk to the centre. Valkenberg itself just seems to be a town of bars and cafes, great for a long weekend but not much longer. The castle really is a ruin and in my view not worth the 13 Euro admission, you can see most of it from the campsite for free! Access to the site is almost impossible when approaching from the town as the left bend is too tight. However, carry on up the hill and after 2 kms you come to a roundabout so you can then approach from the other way which is fairly straightforward. Site facilities are very dated, showers cost extra. Pitches are not big, but you do get your own hammock!! There are daily bread deliveries too. 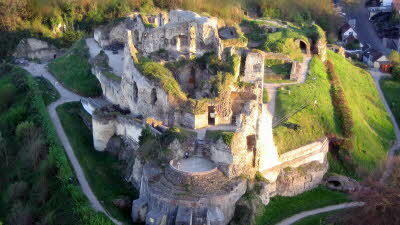 Perfect site for Valkenburg. Site is on a plateau with fantastic views. Site was clean staff very friendly and helpful. 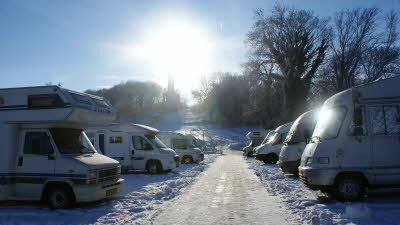 A 10 minute walk down the hill to Valkenburg and 20 minute walk back up the hill. Alternatively you can get the chairlift down which is located next to the campsite and the chairlift back. A nice cafe bistro at the top with lots of activities for older kids to do. A toboggan slide and rip wires. Chairlift closes at 6 o'clock so beware if you don't fancy walking back up the hill. Valkenburg is lovely with a plethora of fantastic restaurants.